January, or for many, Veganuary… The start of the new year is the most popular time to change our eating habits, and with many taking note of the environmental impact the meat industry has on earth, many have vowed to eat less to zero animal products. Cue the release of Gregg’s Vegan Sausage Roll. Britain has been in complete uproar. Children are crying, we’ve forgotten about Brexit, Piers Morgan has thrown up on national television (again, yikes). Lest we forget, there’s a rainbow after every storm and that rainbow is Greggs’ next level marketing. It began with the advert. A parody of the Apple iPhone’s next generation release, it was from this moment we knew Greggs wasn’t holding back with this campaign (or their budget). Perhaps it was a subtle dig at the “snobbishness” against the hot takeaway food. Can you believe there are people in parts of Britain who haven’t even heard of Greggs? Anyway, digital brand manager, Neil Knowles, claimed the brand didn’t “outspend” for this campaign but merely considered ways they could be “smarter to punch above their weight,” and they most certainly have. 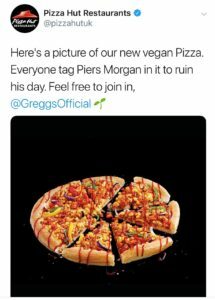 The mixture of controversial and positive feedback following the launch of the vegan sausage roll has the public forgetting this isn’t Greggs first vegan product… We bet you feel silly now. 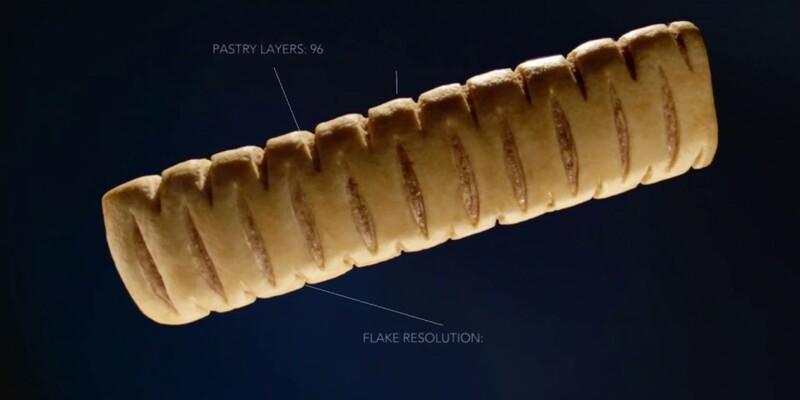 That’s the thing about Greggs marketing, despite the “snobbishness” against the company, Greggs have always set the bar high for marketing campaigns and social media comebacks. Click here to see some of Greggs best retaliations to angry carnivores. And let’s not forget about the time Greggs launched a candlelit dinner for two just in time for Valentines Day… Greggs do many things right, but one thing we can’t fault them for is their marketing, especially for sticking to their guns. 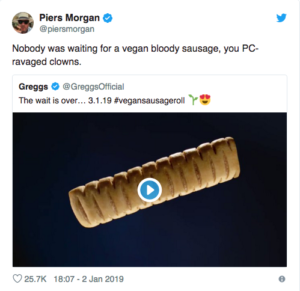 They started the vegan sausage roll campaign with satirical humour and you can bet they’ll finish this campaign with it too. Catherine Shuttleworth of Savvy Marketing claimed that Greggs marketing strategy is “simple yet not straightforward,” Shuttleworth went onto credit Greggs’ bravery for using an “irreverent tone to encourage conversation.” In the spirit of Greggs V Piers Morgan, we saw a union of well-known food businesses come together to take on Mr Morgan; hopefully we’ll see more of these foodie businesses and brands adopting this irreverent tone to battle controversial and negative backlash, because boy is it entertaining. Have you tried a Greggs Vegan Sausage Roll? What were your thoughts? If you need further validation from a foodie expert, check out Street Food Warehouse’s vegan sausage roll review with Benji Wild/Astroid Boys. When you want to hate the Greggs vegan sausage roll but …..